Well, I am going to share how I view one magazine and why I think that I am not alone in still loving the medium. 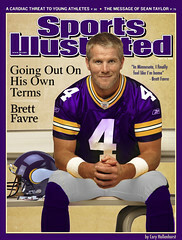 The magazine I am talking about is Sports Illustrated. Hang around me long enough and you will know that in my world sports is the universal language. If I am stuck at a party with people that I wouldn’t normally hang with all I need to do is find a fellow sports person and I’ll have a great time. As I result I look forward to, in fact I anticipate, the arrival of Sports Illustrated in the mail on Thursdays. In fact, if the delivery is off by a day I suffer a bit. It’s part of my life, it’s part of my existence. It’s actually safe to say that it is part of the content of my life. Why? Of course, it’s the passion and escapism that I enjoy with sports. It’s the human interest. I don’t care much for the business of sports but the people intrigue me. It’s this interest that makes the content of an issue of SI the perfect thing to indulge in once a week as a treat. I love the one long feature story each week. In fact, I always thumb through it before I read it, just to see how many physical pages it takes up. I love that. Hey, and for the marketer in you, I even love the ads. I love the pull-out ads that are three pages wide. I notice them and I absorb them. Good luck doing that on your iPad. And guess what doesn’t happen in my magazine? When I turn a page, an ad doesn’t cover up the content and force me to fight through it to read what I want. If you are an advertiser that thinks this is a good idea, then I will be as polite as possible and just imply that you might be clueless. I bet if you could see exactly where most people supposedly clicked through on those new age interstitial ads—it would be right around the “close” button. They wanted to close but they just had bad aim. As a result, you tell the advertiser they got a clickthrough. Nice! Here’s the kicker, though. I have never (well never is strong) been to the SI Web site. Why? Because it’s not the magazine. Sure, there is a lot of content there and I bet it’s good, but the presentation is flat. Literally, it’s flat. I can’t hold it, I can’t fold it, and I can’t bring it everywhere that I might read (you fill in the blanks on that one). In fact, in its online form, the content suffers. It’s less real. It’s less visceral. It’s just less fun. For those of you snickering that when the likes of me dies, then the magazine industry will die with me, I have a little secret to share with you. My kids love the magazine, too. They even get Sports Illustrated for Kids and they don’t go online to enjoy it. They read it like their Dad. They read it like it was originally intended. They want to read a magazine. Oh, and just try to get nine playing cards of a variety of athletes from the iPad version of SI. Apple’s good but they will never be that good. If I never visit the SI Web site again, I will be more than fine as long as the magazine is around. The day that it doesn’t come in the mail is the day that the anticipation dies. Thus, much of the effectiveness of the content dies with it. If I can just go to the site any time and get the “news,” then it means nothing to me. I don’t want this content that way. I want it my way. I want the pop of a great photo and the fun of infographics in print. I want the feel of a page and the fun of turning a page. Call me old fashioned, but good content never goes out of fashion when it’s in the right package. Magazines will always have a place. That place may shrink over time but it will always be a place. I’m glad for that. Excuse me while I read my magazine.